Snow and Winter are beautiful for all the skiing and picture post card landscapes with wonderful mountains and happy children building plump round snow men and making cute little snow angles everywhere they can. Who doesn't dream of the warm cozy fire place with dancing flames flickering their golden glow over wistful faces and glasses of hot cocoa. Those faces are usually full of that certain look of total exhaustion from having just spent the last four hours shoveling out from those 8 to 12 inches of what the weatherman told us was coming: SNOW. Now, imagine your sidewalks and pathways continuously clear of snow and ice without ever having to lift a shovel, start a snow blower, or spread messy, hazardous chemicals. Heavy-duty and durable, Ice and Snow Control Mats and Treads are built to stand up to the harshest winter weather and leave a clear path for pedestrians and vehicles. Ice and Snow Control Mats and Treads can be moved easily from one problem area to anther and can be unrolled in the fall and picked up in the spring. It is designed to roll out over most surfaces including wood, metal, concrete, or asphalt. This is the product for which property management companies, facility management directors, risk management officers, and safety directors have been clamoring for years. There are some very cogent reasons for making the move to equip a property with Ice and Snow Control Mats even beyond the obvious ones of: "I won't have to shovel" and "neither will you". Snow removal is a liability even after you shovel the walk. Leave one little patch of snow or ice and all of your due diligence could be for naught. Even if you get your people out there early it could be too late. And, right after you gain a foothold all around the campus, another snow storm right on the heels of the last can blow your budget containment dreams into next winter. The creation of dependable snow-free and ice-free areas and pathways with the deployment of Ice and Snow Control Mats and Treads can pay dividends for years in diminished labor expenditures, fewer accident claims, reduced lost-man-hours from snow removal related injuries, lower expenditures on sand and salt and the labor related costs to disburse them, easier and dependable access to your facilities for your clients, customers and employees, and more peace-of-mind about how you will be able to deal with ice and snow when mother nature deals her annual winter challenge your way. Are Ice and Snow Control Mats and Treads the answer to all you snow removal problems? Maybe not. But, where ever you can place a set of Ice and Snow Control Mats and Treads will be where the least of your snow removal problems will be. Just keep adding areas of Ice and Snow Control Mats and Treads to your annual budget and after a time you will see your snow and ice and ice and snow related concerns literally melt away. Spaced 36 inches apart, these pre-installed grommets prove convenient places to anchor the mat. (If additional anchoring points are required, such as for use on stairs, a separate grommet kit is available. Provides reliable and even distribution of heat. Helps prevent slip and fall accidents. Applications: Ice and Snow Control Mats and Treads offer effective solutions for a variety of applications requiring ice and snow elimination. Applications include sidewalks, decks, loading docks, roof top access pathways, wheelchair ramps or any area with heavy foot traffic. 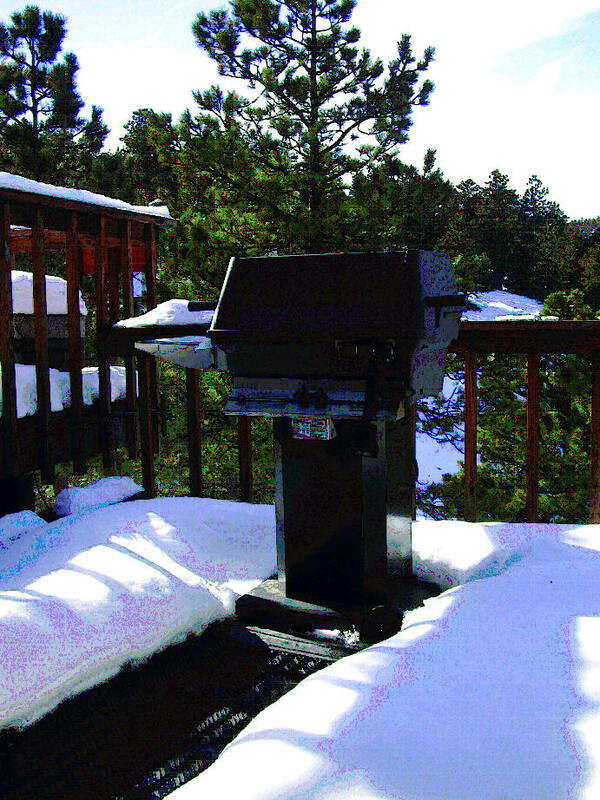 If you are hungry for a nice outdoor home style Bar B-Q, but it looks like you'll have to wait until the Spring thaw. Electrical Energy Consumption: Ice and Snow Control Mats and Treads, as all electrical appliances, are described from an electrical energy consumption point of view by the rate at which they use electrical energy. (Click HERE for a summary of the wattage rating system). The 2 foot wide Ice and Snow Control Mats are rated at 64 Watts per linear foot. 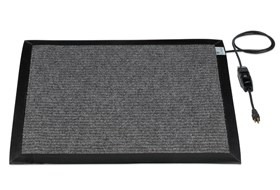 The 3' wide Ice and Snow Control Mats are rated at 104 Watts per linear foot. To determine the electrical consumption of a particular Ice and Snow Control Mat, multiply the linear feet (i.e. a 2' x 20' mat has 20 linear feet) by the number of Watts per linear foot (in the case of 2 foot wide mat it is 64 Watts) and divide the result by 1,000 to yield the number of kilowatts consumed by that mat in an hour. So, a 2' x 20' mat = 20 x 64 = 1,280 divided by 1,000 = 1.28 kilowayys per hour. If the local cost per kilowatt hour is 13 cents per kilowatt hour, that 2' x 20' Ice and Snow Control Mat would cost 1.28 x 0.13 = $0.166 or about 17 cents per hour to run. Please refer to the Price Chart for available mat sizes and detailed descriptions of each mat including the wattage rating. Then use the above formula to determine the overall consimption and cost per kilowatt hour for the mats required to run your Ice and Snow Control System.